Our favorite holiday is rolling around! Come celebrate Halloween with HAPPYFUNSMILE! 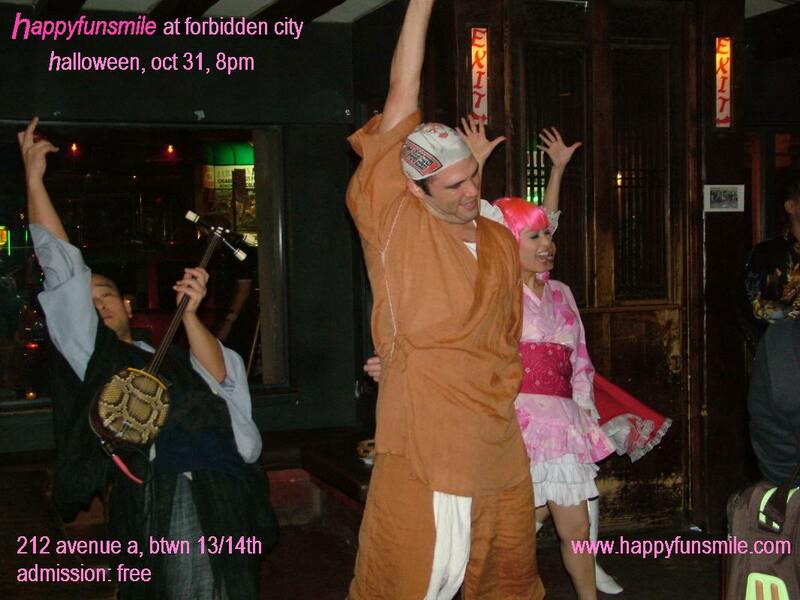 We’ll be wandering around the East Village spreading chindon to all the Japanese restaurants and bars, ending up at Forbidden City with a full performance. Get our your costumes and join the fun! Double bill with Daniel Levin (cello), Rob Brown (sax) and Michael Evans (percussion). New tunes and a collaboration with Daniel and Rob. Update: Check out photos from the performance at Peter Gannushkin’s site. SOH DAIKO had a quick performance at the Japanese American Association banquet at Jazz at Lincoln Center on Saturday 9/29. We only played one number (Hachidan), but the loading, prep time, and unloading took the better part of the day. The performance went well, although most of the audience was in the reception room at the time. You are currently browsing the wynn yamami blog archives for October, 2007.